Under the Hindu law and Muslim law tort had a much narrower conception than the tort of English law. The punishment of crimes in these system occupied a more prominent place than compensation for wrongs. 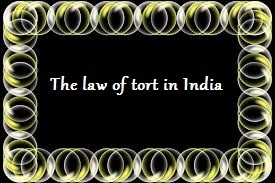 The law of torts as administered in India in modern times is the English law as found suitable to Indian conditions and as modified by the Acts of the Indian Legislature, but its origin is linked with the establishment of British rule in India. Question - How tort can be discharged? Explain various modes of discharging torts. Essential elements to constitute tort.. Some Important Definitions of "Tort"